Pot pies. That term does not stir up pleasant images in my head. Thick pies of lead is what I see. This image was not improved upon when I began my fast food career in high school. There is nothing behind those counters that makes your mouth water and pot pies are certainly no exception. I’ll leave at that, only saying that twenty pound tubs of butter are gross. I don’t think we ever did the pot pie thing in my family and, to be honest, I don’t think I’ve ever had one. The weather here has been pretty nice for November but every now and then it dips down and I want something warm and hearty. 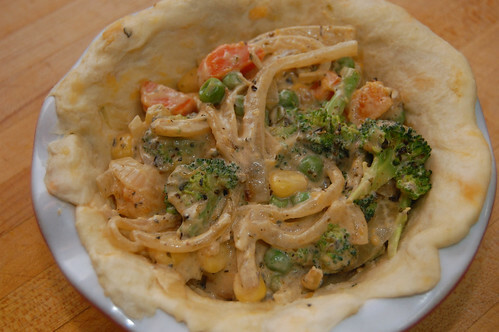 Having nothing to really go on with regard to what a pot pie should be, I decided to just go with what I would want out of a pot pie: strong presence of veggies with something that doesn’t make me feel like I ate a brick. Prepare a 9 inch pie pan with your crust and set aside. Preheat the oven to 400. Saute the onion under medium high heat with 1 table spoon of oil until browned, stirring only occasionally; approximately 6 minutes. Move to a large mixing bowl and season with a pinch of salt and pepper. Saute the squash and carrots in two teaspoons of oil for 3-4 minutes until browning and add to bowl of onions. 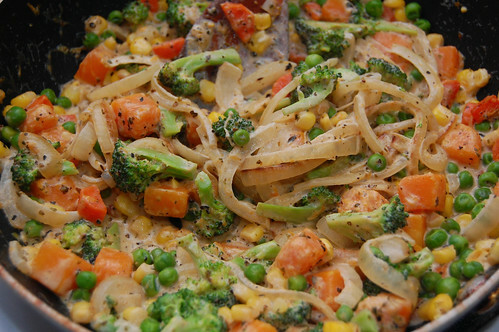 Saute the broccoli, corn and peas in one tablespoon oil for two minutes then add the vegetables back to the pan. Toss to mix, and the cream, stock, marjoram and mix together. Add salt and pepper to taste. 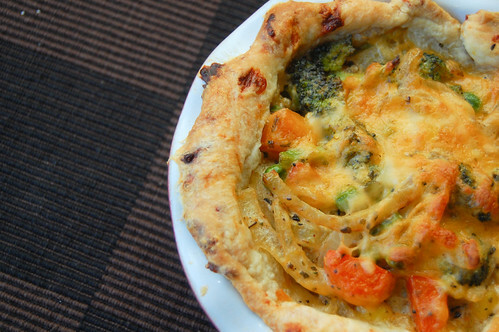 Fill the pie pan with your vegetables and either top with more crust or sprinkle with cheddar. Bake in the oven for 20-25 minutes until the crust (or vegetables) have become browned or crisp. Serve and enjoy. « Need Some Thanksgiving Suggestions? Heh, I just realized the onions are not noodles…I think that’s where I’d make a substitution. Noodles is an excellent idea! I think I’d just add to the pie, though… I’ve gotta try that. I’d take out the peas and use edamame instead. Looks good. I like how you don’t have a bottom AND a top crust -that’s too much crust for me! Hmm, I don’t think I’ve ever cooked with edamame before… Looks like I need to go for version 2.0 and give these substitutions a shot. Ooooh comfort food. Good thing I can’t gain weight just looking at food, b/c I’ve been salivating over everything y’all have posted recently. Actually I’ve heard you CAN gain wait from thinking about food too much! Something about your body continually prepping itself to eat but not being fed… ha! Given how much I think about food, I find that very disturbing. This is a fabulous recipe. However, be sure that after you add the cream and veggie stock, you cook off the excess liquid (I skipped over that step). Otherwise the pie crust will be a soggy mess underneath and not much of a pie. But yum yum!